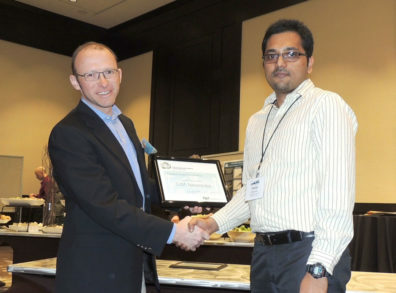 Ph.D. student, George Mathew Neerackal, won 2nd place at the Ron Sheffield Memorial Student Poster competition at the Waste to Worth conference, Seattle, WA; March 30-April 03, 2015. Dairy cows produce lots of manure. A WSU student’s research on cutting the environmental impact of all that waste won him second place in a poster competition at Seattle’s annual Waste to Worth conference. George Neerackal, who graduates later this year with a doctorate in Biological Systems Engineering, took second in the Ron Sheffield Memorial Student poster contest, held March 31 to April 3.